Strawberry season is so short-lived; it calls for something celebratory. Weeks ago, I started thinking about what I wanted to make with this year's crop. From the few plants I have in my plot, I get a good seven or eight handfuls of berries at most (not counting the ones I eat on the spot). There's not enough for a pie, nor a jarful of jam, so I pondered other possibilities. Cheesecake with strawberry topping? Strawberry parfaits? Strawberry ice cream? A small strawberry tart for two? Decisions, decisions. So I asked my husband what he would like to have with this year's strawberries, and he immediately gave me a look that spoke two magical words before he even uttered them from his mouth. But of course. 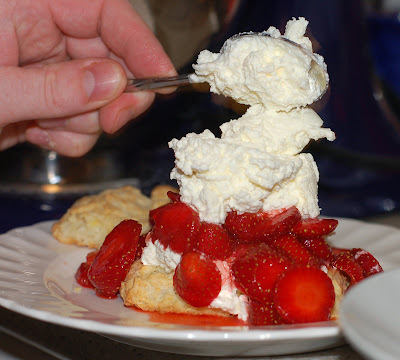 We celebrated last year's strawberry crop with shortcakes and cream, and that's how we would do it again. There is a reason why strawberry shortcake is a classic dessert. Why mess with perfection? I use Williams-Sonoma's recipe for the shortcakes. 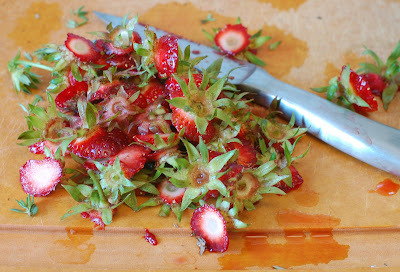 Their recipe calls for a teaspoon of grated lemon peel, which is utterly complementary to the strawberries. And there's a little bit of salt in the shortcakes too. Don't skip the salt. I used to think it was odd to include salt in recipes for sweets, but I have since learned what I was missing. Keep the salt. Trust me. This is just mouth watering. The photographs are fabulous and I just want to pick the strawberries from the computer screen. I will definately now be getting more strawberry plants thanks to you - roll on next year. Okay, now I am craving Strawberry Shortcake. Thanks! Those look like great shortcakes, Christa. People need to remember that the stuff masquerading as "shortcake" premade near the supermarket strawberries this time of year are anything but real shortcake. The word "short" comes from the butter or fat (or "short"ening) in the dough. The cakes should be savory and just a bit crumbly. Traditionally, some people even made these on top of a griddle. We use the recipe in Joy of Cooking. And you are right: Why mess with a classic, although plenty of people do. Christa, these photographs are great, and your strawberries look fabulous! I'm glad you enjoyed the berries...what a treat! Maybe I can talk my dad into parting with some of his strawberries, though they won't be ripe for a while. 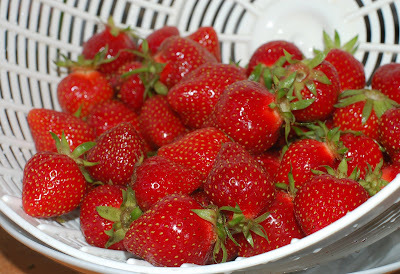 I can start hinting now ... since garden strawberries can't be beaten. Besides tasting delicious, I love that they are different sizes... and a beautiful colour of red. This looked delicious and I think you have a wonderful tradition going!! You take the best photos!! I haven't visited in a while but, whenever I do I feel envy....and hunger. We just had strawberry shortcake [with the berries from the store, alas] but your luscious photos make me want More, More! Christa, you'll be horrified to know that the real whipped cream must be replaced with fatfree frozen yogurt - but we can still enjoy the berries! I hope to soon have enough berries for my own strawberry shortcake! Those look yummy! All I can say is WOW! Those strawberries sure look good! We just planted strawberries this year, so we won't have beautiful berries like that for a while. But looking at your great pictures, I can hardly wait! your pics make this look great! I'll have to try that recipe! The curent post at "Uncle Tom's Garden" just reminded me that I should get to my local famer's market this weekend, and you've given me a great idea for the strawberries I'll probably find there. Looks like it's going to be a delicious weekend. 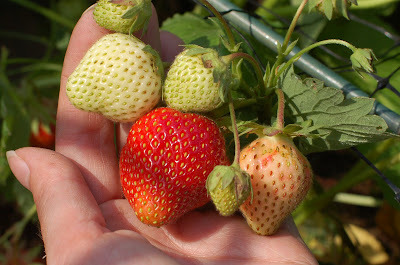 Wow, you already started harvesting your strawberries! Wonderful photos - they look yummy yummy! Well, our strawberries will still need some more weeks! Thanks for your comments, everyone. If you give this recipe a try, let me know what you think of it. Sara, I am glad I inspired you to get more strawberry plants. Strawberries picked right from the garden can't be beat! Ed, I know what you mean about the pre-made "shortcakes" in the supermarket. I don't think I could ever eat those again, after having had the real thing. There's a whole stick of butter in these. I'd rather eat butter than something with a long list of things I can't pronounce. LOL. I'm not horrified. I mostly eat nonfat or lowfat dairy products myself. Fat-free frozen yogurt is a good thing! We splurged on the cream for this special occasion. Everyone -- Have a great weekend in your gardens! I must say WOW along with everyone else. What truly delectable and inspiring photos! Apologies for being a "lurker" until now. I check your site regularly and always enjoy seeing what you're up to. yummmmm... oh that looks rich! Have to agree with the comments about the gorgeous strawberries. 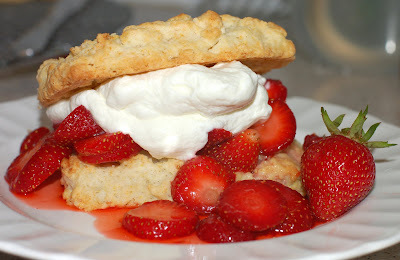 And, of course, nothing beats real, freshly-whipped cream to top homemade biscuit-type cakes. 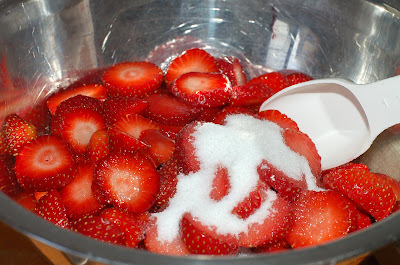 But, for someone like me, who is paying the price of too much of the good things in the past, strawberries must be enjoyed without fats like butter, salt in the shortcake and real whipped cream. I'm here to tell you that fresh strawberries (sweetened with Splenda) on shortcakes made with healthy oil and no salt, and topped with non-fat yogurt, are a perfectly acceptable, occasional healthy treat. Can't wait for the Farmers' Market on Wednesday! - A first time poster. I received my strawberries from someone who left some extra plants (anonymously) by the community garden shed for any takers. I never had the chance to ask the giver what type they are. They are a June-bearing variety (as opposed to an ever-bearing), but that's all I know. There is an article here that recommends a few different types. Sorry I can't be more specific. M,M,M,M,M,M,YUM. OUR MOUTHS ARE WATERING. GREAT COMMENTS. FROM THE CHEERY PEOPLE ON THE MT. CORINNA VON DEUTCHLAND E-MAILED US RECENTLY. WE'LL REPLY TO KEEP THE CONTACT ROLLING. SHE SAYS 'HALLO' AND ALL'S WELL. I CAN ALMOST SMELL THE BERRIES!!! !